Wiregrass Decorative Painters participated in the Community Day at the library for service organizations to show people what their organizations are all about. 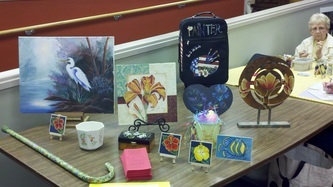 Joretta donated the door prize from WDP. It was an eagle on a flag background. Surprise - It was the first one chosen from all the donated door prizes. 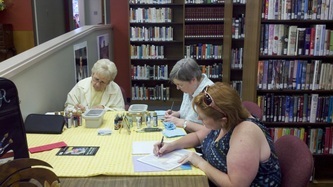 Andrea, Sue and Joretta painted while Linda talked to people about our chapter and how easy it is to learn to paint. We set up a display so people could see our work. The Mayor was impressed with the suitcase and I offered to teach him how to paint one with a manly design so he could identify it at the airport. He just laughed.